Citation: de Almeida MTB, Sant’ Anna Aragão IC, Sant’ Anna Aragão FM, et al. Morphological study on mitral valve chordae tendineae in the hearts of human fetuses. Int J Anat Var. Mar 2019;12(1):017-020. BACKGROUND: Mitral valve chordae tendineae (CTs) are filaments of connective tissue that attach the mitral valves to the papillary muscles, which contract and cause tension on these chordae, so as not to allow separation of the valves during left ventricular systoles. The morphological particularities of CTs not only facilitate understanding of the genesis of mitral valve diseases, but also provide the basis for improvement of surgical techniques. OBJECTIVE: To evaluate some morphological aspects of mitral valve CTs and papillary muscles, including number, distribution, type and macroscopic texture. MATERIAL AND METHODS: An anatomical descriptive study on mitral valve CTs and papillary muscles was conducted on 27 hearts from human fetuses. The CTs were dissected via a longitudinal incision adjacent to the interventricular septum, and were viewed using a binocular stereoscopic microscope and documented via photographs. The following variables were analyzed: number and anatomical distribution of papillary muscles, number of heads per group of papillary muscles and number of CTs per muscle head. The CTs were classified in accordance with the methodology proposed by Lam (1970) and Gunnal et al. (2015). RESULT: In 27 mitral valves, a total of 827 CTs was found, and “true chorda” was the predominant type of chorda. Approximately 717 CTs originated from the 497 muscle heads. These chordae and muscle heads were shared approximately equally among the papillary muscle groups, with similar chorda/head proportions. The number of CTs per head in the papillary muscle groups ranged from 0 to 6 chordae/head. There were 663 chordae with tendinous macroscopic texture and 84 with simultaneously tendinous and membranous texture. CONCLUSION: Mitral valve CTs were predominantly of true type, with similar distributions among papillary muscle groups; and the false chordae that were found were more commonly fixed in the posterior papillary muscle group. The CTs generally originated in the apexes of the papillary muscle groups, with variations in the numbers of muscle heads and the numbers of chordae per head. The main macroscopic texture of the CTs was tendinous, complemented by occurrences of chordae with simultaneously tendinous and membranous texture. Mitral valve chordae tendineae (CTs) are fibrous bundles with tendinous, membranous or muscular texture that connect heart valve cusps to papillary muscles in heart ventricles . Papillary muscles are conical muscle projections in which the base is fixed to the ventricular walls . They are classified into two muscle groups: anterior and posterior papillary muscles, both composed of a certain number of heads [3,4]. During left ventricular systole, when the papillary muscles contract, they apply tension to the CTs, such that the valves are not allowed to open , thereby avoiding mitral valve prolapse [6,7]. Left ventricle CTs are divided into true and false: true CTs are directly inserted in the mitral valves, while false CTs are implanted in the papillary muscles and ventricular walls . Detailed studies on the morphological particularities of CTs not only may facilitate understanding of the genesis of mitral valve diseases, for example, mitral insufficiency as a consequence of chorda rupture , but also may provide the basis for improvement of the surgical techniques for correct anatomical defects in CTs [10-13]. In order to conduct minimally invasive procedures, it is paramount that cusps and CTs are handled carefully. Therefore, anatomical knowledge of these structures is essential. The objective of the present study was to evaluate some morphological aspects of mitral valve CTs and papillary muscles, including number, distribution, type and macroscopic texture. An anatomical descriptive study on mitral valve CTs and papillary muscles was conducted on 27 hearts from human fetuses (15 male and 12 female). The fetuses were presumed to be between 5 and 8 months of age, presented integrity of the thoracic region and did not show any external signs of any type of disease or congenital anomaly. All the fetuses were obtained in accordance with Law 8501 of November 30, 1992, which provides rules for the use of unclaimed corpses for the purposes of scientific studies and research. These fetuses were available in the Anatomy Laboratory of Tiradentes University, Farolandia campus, in Aracaju, state of Sergipe. The present study was approved by the ethics committee of the Federal University of Sergipe, under protocol no. 77349017.8.0000.5546. In order to conduct dissection, the hearts were carefully washed in running water to remove clots from inside the ventricles, in order to preserve the integrity of the CTs. Next, through an opening in the ascending portion of the aorta, a longitudinal incision adjacent to the interventricular septum was made to provide an adequate view of the mitral valve components. All the CTs were viewed using a binocular stereoscope microscope, with 1X ~ 4X zoom and 10X ~ 160X magnification, and were documented through photographs. Regarding the anatomical description, the following variables were analyzed: number and anatomical distribution of the papillary muscles, number of heads per papillary muscle group and number of CTs per muscle head. The CTs were classified in accordance with the system proposed by Lam (1970), as true or false. The macroscopic aspects of the structure textures (tendinous, membranous or muscular) were classified in accordance with the system proposed by Gunnal et al. .
Absolute and relative percent frequency was used to describe categorical variables. Chi-Squared Test was used to evaluate associations between categorical variables. Discrete/Continuous variables were described by mean, standard deviation, maximum and minimum. Discrete/Continuous variables adhere to normal distribution (Shapiro-Wilks test: p>0.05). T test was used to evaluate mean differences. We adopted 5% as significance level and R Core Team 2019 was used in all statistical analysis. In all the 27 mitral valves dissected, a total of 827 CTs were identified, most of them found in the posterior papillary muscle group and predominantly of “true” type (p=0.021) (Table 1 and Figure 1). Out of the total number of chordae tendineae, 86.7% originated at the apexes of the papillary muscles and were proportionally distributed among both muscle groups (number of chordae (p=0.787) and number of heads (p=0.802)), at a ratio of approximately 1:4 (chordae per head) (Table 2). The number of CTs per head in the papillary muscle groups ranged from 0 to 6, and approximately 90% of papillary muscles presented 1 or 2 CTs per head (p=0.417) (Table 3). Table 1: Numbers and types of mitral valve CTs per papillary muscle group. 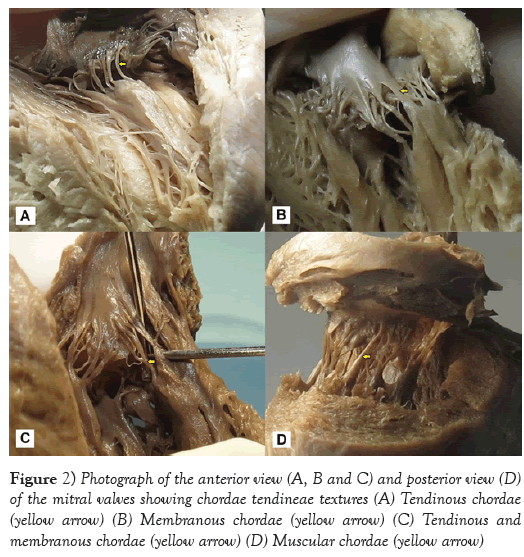 From macroscopic observation, 75.17% of the CTs presented a tendinous texture, and this was most frequently seen in the posterior papillary muscle group, followed by a tendinous and membranous texture (10.16%) in the APMG (p<0.001). On the other hand, the least frequent type was the muscular texture, also found in the anterior papillary muscle group (Table 4 and Figure 2). Among the 827 chordae tendineae found in all the 27 mitral valves from human fetuses that were analyzed, 82.47% were of “true” type. Similar findings were described by Gunnal et al. , Lam , and Krawczyk-Ożóg et al. . According to these last authors, this type of CT was most frequent in the PPMG. This finding was also similar to what was found in the present study. Among the 17.53% of the CTs that were FCs, 61.38% were found in the PPMG. Gunnal et al. reported the presence of FCs in 56% of the 116 mitral valves that they analyzed, and Krawczyk-Ozog et al. observed the presence of FCs in 14% of the 100 hearts that they dissected, and also found that these occurred more frequently in the PPMG. The papillary muscles were well characterized as an anterolateral and posteromedial complex, and they were located close to one another. These findings were similar to what was reported by other authors [3,4,14-17]. Roberts and Cohen et al. described papillary muscles as trunks that individually originated, on average, from 6 heads, which resulted in a ratio of 12 CTs per head. Krawczyk-Ożóg et al. reported an average of 8.8 heads in the APMG and 7.7 in the PPMG. In the present study, the average number of heads (approximately nine) was similar in both papillary muscle groups. In two hearts, the anterior papillary muscle was found directly fixed to the base of the anterior mitral valve, and no CTs originated from this head. This finding is in accordance with what was described by Gunnal et al. . It can be inferred that this variation in the numbers of CTs and heads per muscle group might be considered to be anatomical variations. A tendinous texture, macroscopically characterized by short, thin fibrous threads, was found in 100% of the sample studied by Gunnal et al. . In the present study, a tendinous texture was found in 80.17% of the CTs. In addition, Millington-Sanders  reported that mitral valve CTs had a wavy collagenous arrangement surrounded by elastic fibers that presented adaptation to cyclical tensions. This collagenous tissue did not show clear limits between chordae and valves. According to those authors, this arrangement would give rise to unidirectional distribution of forces over the surface of the leaflets. Khalighi et al. accepted that the composition of the tendinous texture of CTs would enable a better flexibility of harmonic movement range between the chordae and valves during the cardiac cycle. The membranous and muscular textures of the CTs were described by Gunnal et al. , who identified muscular chordae in 14.65% of the mitral valves, and membranous chordae in 6.03%. Lam et al. found muscular chordae in 16% of the 50 hearts that they dissected, and Krawczyk-Ożóg et al. identified this type of chorda in 11% of a 100-heart sample, of which 80% were located in the APMG. In the sample analyzed in the present study, it was found that 6.53% of the chordae were membranous and that 3.14% were muscular. These were distributed as follows: 63% in the APMG and 73% in the PPMG, respectively. It is important to highlight the simultaneous presence of CTs with both tendinous and membranous profiles that resulted from their ramifications, which thus originated multiple chordae. This provided various textures in 10.16% of the 27 mitral valves dissected. It might be suggested that these types of chorda would provide higher resistance and help in mitral valve coupling during ventricular diastole. According to Lam , membranous and muscular CTs probably develop as a response to the need for a stronger valve annex that spreads over cusp surfaces. This author also considered muscular chordae to be the ones that did not evolve during their development and persisted as embryonic, meaty muscle structures along their entire length, presenting a tendinous origin and insertion, which did not alter valve functioning. Thus, membranous and muscular CTs may cause higher tension and greater stabilization for mitral leaflets because of the coarse aspect of their structure, compared with tendinous CTs. Previous knowledge of the morphology of CTs using echocardiography has contributed towards reduction of the risks of heart structure injuries in interventional therapies to repair subvalvular structures [20,21]. On the other hand, use of synthetic material to replace damaged natural CTs in valve reconstruction procedures currently combines preoperative echocardiographic evaluation of measurements of these natural chordae and their insertions in the left ventricle, with the objective of preserving the natural anatomy. In most cases, this is seen during the postoperative period to have been successful [22,23]. CT integrity is essential for optimum functioning of the left ventricle. In order to correct for total CT ruptures, partial transference of chordae from the tricuspid to the mitral valve is recommended . In turn, to correct for rupture of specific chordae of the anterior cusp of the mitral valve, chordae of posterior cusp are replaced by chordae from the anterior cusp . Surgical interventions that prioritize mitral valve replacement and preservation of CT continuity, in patients with chronic mitral insufficiency, have a smoother postoperative period, with low risk of complications . The mitral valve CTs were mainly of “true” type, presenting similar distributions between papillary muscle groups, while false chordae were found in higher numbers in the PPMG. The CTs commonly originated from the apexes of the papillary muscle groups and presented variations in the numbers of muscle heads and the numbers of chordae per head. The main macroscopic texture of the CTs was tendinous, followed by the simultaneously tendinous and membranous texture. 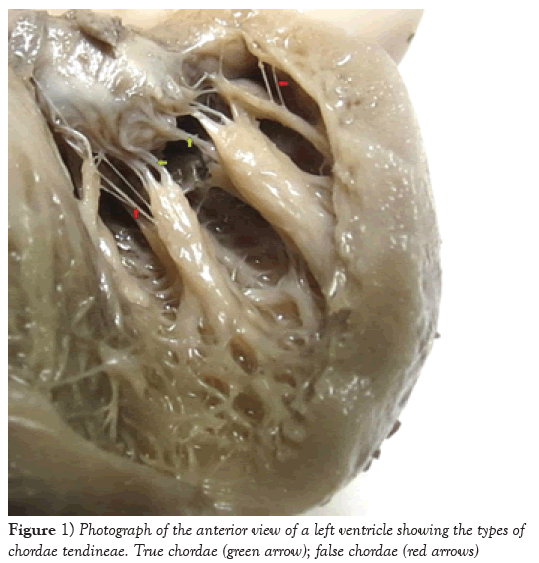 It is important to understand the morphology of mitral valve chordae tendineae in order to underpin better knowledge of heart anomalies and be better prepared for undertaking minimally injurious surgical techniques. Gunnal SA, Wabale RN, Farooqui MS. Morphological study of chordae tendinae in human cadaveric hearts. Heart Views. 2015;16:1-12. Oosthoek PW, Wenink AC, Wisse LJ, et al. Development of the papillary muscles of the mitral valve: morphogenetic background of parachute-like asymmetric mitral valves and other mitral valve anomalies. J Thorac Cardiovasc Surg. 1998;116:36-46. Berdajs D, Lajos P, Turina MI. A new classification of the mitral papillary muscle. Med Sci Monit. 2005;11:18-21. Gunnal SA, Wabale RN, Farooqui MS. Morphological variations of papillary muscles in the mitral valve complex in human cadaveric hearts. Singapore Med J. 2013;54:44-8. Marzilli M, Sabbah HN, Lee T, et al. Role of the papillary muscle in opening and closure of the mitral valve. Am J Physiol. 1980;238: 348-54. Godley RW, Wann LS, Rogers EW, et al. Incomplete mitral leaflet closure in patients with papillary muscle dysfunction. Circulation. 1981;63:565-71. Boudoulas H, Kolibash AJ Jr, Baker P, et al. Mitral valve prolapse and the mitral valve prolapse syndrome: a diagnostic classification and pathogenesis of symptoms. Am Heart J. 1989;118:796-818. Lam JH, Ranganathan N, Wigle ED, et al. Morphology of the human mitral valve. I. Chordae tendineae: a new classification. Circulation. 1970;41:449-58. Gregori Jr. F. Conservative surgical management of mitral insufficiency: an alternative approach. Rev Bras Cir Cardiovasc. 2012;27:312-7. Osmundson PJ, Callahan JA, Edwards JE. Ruptured mitral chordae tendineae. Circulation. 1961;23:42-54. Sanders CA, Scannell JG, Harthorne JW, et al. Severe mitral regurgitation secondary to ruptured chordae tendineae. Circulation. 1965;31:506-16. Marchand P, Barlow JB, Du Plessis LA, et al. Mitral regurgitation with rupture of normal chordae tendineae. Br Heart J. 1966;28:746-58. Gregori Junior F, Godoy MF, Cordeiro CO, et al. Surgical repair of chordae tendineae rupture after degenerative valvular regurgitation using standardized bovine pericardium. Rev Bras Cir Cardiovasc. 2013;28:36-46. Krawczyk-Ozog A, Holda MK, Bolechala F, et al. Anatomy of the mitral subvalvular apparatus. J Thorac Cardiovasc Surg. 2018;155:2002-10. Roberts WC, Cohen LS. Left ventricular papillary muscles. Description of the normal and a survey of conditions causing them to be abnormal. Circulation. 1972;46:138-54. Ramsheyi SA, Pargaonkar S, Lassau JP, et al. Morphologic classification of the mitral papillary muscles. J Heart Valve Dis. 1996;5:472-6. Ho SY. Anatomy of the mitral valve. Heart. 2002;88: IV5-10. Millington-Sanders C, Meir A, Lawrence L, et al. Structure of chordate tendineae in the left ventricle of the human heart. J Anat. 1998;192:573-81. Khalighi AH, Drach A, Bloodworth CH, et al. Mitral valve chordae tendineae: Topological and geometrical characterization. Ann Biomed Eng. 2017;45:378-93. Dal-Bianco JP, Levine RA. Anatomy of the mitral valve apparatus: role of 2D and 3D echocardiography. Cardiol Clin. 2013;31:151-64. Pozzoli A, Zuber M, Reisman M, et al. Comparative anatomy of mitral and tricuspid valve: What can the interventionlist learn from the surgeon. Front Cardiovasc Med. 2018;5:80. David TE. Replacement of chordae tendineae with expanded polytetrafluoroethylene sutures. J Card Surg. 1989;4:286-90. Caimmi PP, Sabbatini M, Fusaro L, et al. A study of the mechanical properties of ePTFE suture used as artificial mitral chordae. J Card Surg. 2016;31:498-502. Gregori F Jr, Cordeiro CO, Croti UA, et al. Partial tricuspid valve transfer for repair of mitral insufficiency due to ruptured chordae tendineae. Ann Thorac Surg. 1999;68:1686-91. Carpentier A, Relland J, Deloche A, et al. Conservative management of the prolapsed mitral valve. Ann Thorac Surg. 1978;26:294-302. Westaby S. Preservation of left ventricular function in mitral valve surgery. Heart. 1996;75:326-9.